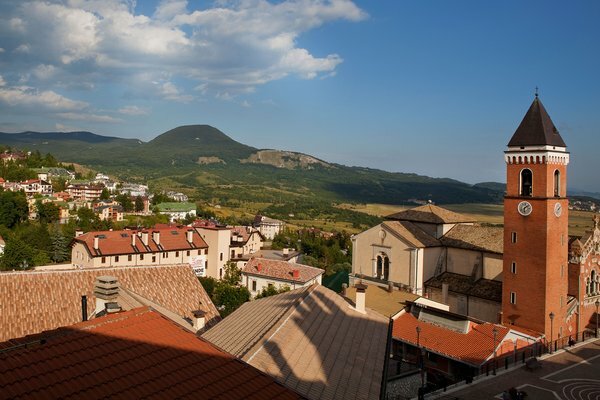 AFFACCIATA DA ORIENTE SULL'ALTOPIANO DELLE 5 MIGLIA, RIVISONDOLI È UNA DELLE STAZIONI SCIISTICHE PIÚ IMPORTANTI IN ABRUZZO E, VISTA NELLA SUA UNITARIETÀ CON L'AREA DI ROCCARASO, COSTITUISCE UNA DELLE PORTE DI ACCESSO AL PIÚ IMPORTANTE COMPRENSORIO SCIISTICO DEL CENTRO-SUD ITALIA. ESSO SI ESTENDE SU UN AREA CHE VA DA 1390 METRI SULLA BASE DEGLI IMPIANTI AI 2.056 METRI DEL MONTE PRATELLO. L'INTERA AREA SCIISTICA, ATTREZZATA CON UNA CABINOVIA CON AGGANCIAMENTO AUTOMATICO, 2 SEGGIOVIE E I 6 SKILIFT SERVE 48 KM DI PISTE DI DIFFICOLTÀ VARIABILE : DAL CAMPO SCUOLA A QUELLE OMOLOGATE PER GARE NAZIONALI ED INTERNAZIONALI. QUESTE ULTIME SONO COLLEGATE CON ALTRI 670 KM DI PISTE SERVITE DAGLI IMPIANTI DELLA LIMITROFA STAZIONE DI ROCCARASO - AREMOGNA - PIZZALTO.